Lets get it right out at at the start of this post – I do not like this hot weather. I can cope with cold but I really cant cope with heat. Well it seems to me that its not just me. It does appear that quite a few of the buses don't like the excessive heat either. It may just be coincidence but I am sure I have either been on, or seen more poorly buses over the last couple of weeks than I do normally. Last week after a nice meal at the Jack Rabbit with my son, we rushed down the hill to the welcome sight of Western National liveried Trident 32716 waiting at the stop on the 15. Ideal for us as it saved us hanging around for the 50. Sat upstairs in the boiling heat and waited for the bus to leave. Several attempts to start the bus later it was apparent that it was not going anywhere. Bus fares refunded and then onto the 50 instead. I saw 32716 sitting at Derriford again later in the week not in service – poorly again by the look of it and the bored looking driver. Friday morning I was waiting for the 50 to work due at my stop at 07:40. Still waiting at 07:50 when a Dart came into view at the top of the hill instead of the more usual Citaro. It was Plymouth Citybus 2 N102UTT and it clearly was not a happy bus. You could see why the bus was late when the driver pulled up to the stop and jumped out of his seat to open the door! His first bus had broken down and this was all they could give him at the time. The non functioning door was the least of the issues. It seems that this bus had major front suspension issues as well. It was bouncing around all over the place! Remember the back seats of the old Leyland Nationals? Just like that! It also then grounded at every speed bump along Miller Way. A really awful ride. It was helped though by an excellent driver with great humour and apologising to all passengers who tried to get aboard. He gave up at Derriford and was taking the bus back out of service to Milehouse. The next 50 should have been almost right behind us by the time we reached Derriford anyway. I have to say this was probably the worse condition Citybus I have been on. Most unusual for them so they must have been really short of buses, or this one was sent out in error. Seen in happier times back in 2007. These used to be regulars on the 50 back then. The fun didn't end there. Whilst chatting to one of the Target Travel Park & Ride drivers we were alerted to the sound of a very poorly Target Travel Solo attempting to leave the bus stop and get up the hill. Not sure which one it was - one of the SA02 Glasgow buses. It managed to reach the zebra crossing and then with smoke billowing out the back it ground to a halt! My friend then assisting the driver so he could roll it back down the hill into the taxi rank so other buses could leave. I was about to take a video clip but my 50 came in and I couldn't wait. A few mins later the 52 driver did get her going again and did get up the hill. We didn't see her again so she didn't break down before Asda at least! Hot Weather Advice: As the temperature shows no sign of falling anytime soon, please be careful when travelling by bus. We know that some of our vehicles can get very warm so please drink plenty of water, try to wear light clothing and be aware of hot metal surfaces on board. We try to do everything we can to keep our vehicles cool, for the comfort of our passengers, but it just isn't possible to further increase the airflow at the speed buses travel. Quite a few people mentioned that the heating was on on their bus. 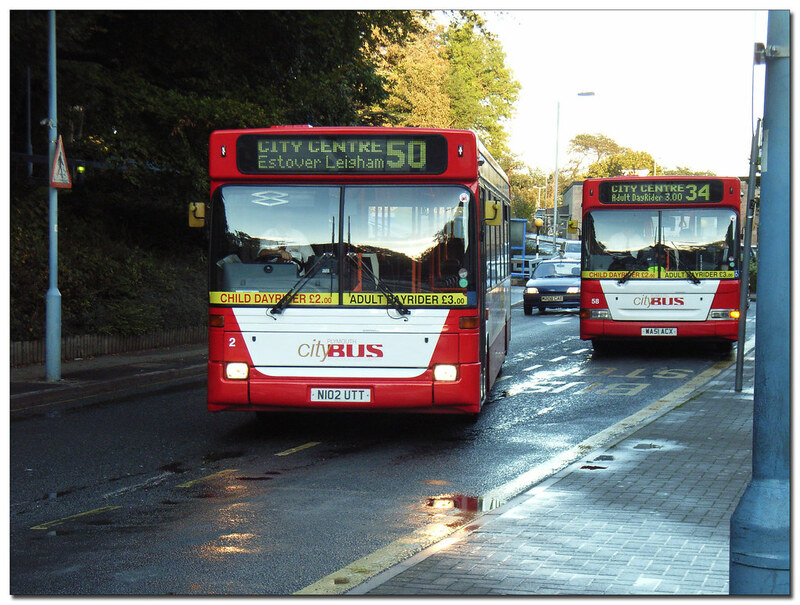 Plymouth Citybus We can assure you all that the heating is not on the buses. The engine and general heat of the bus heats the pipes and makes it seem that way. Unfortunately, there is very little we can about about this. Plymouth Citybus Unfortunately, it isn't us that design the buses and as much as we'd like all of our vehicles to have air conditioning, it is a very expensive addition, not just to fit on the bus but to run. Richard Smith caught this shot of 358 with a happy bunch of passengers on Friday afternoon. Pretty much every bus passenger looking out of the window seeing this bus go past would have been very jealous indeed! Sounds like that could be the end of N102UTT. If it's a costly repair job I doubt they'll think it's worth it! I've not had N102 since the middle of February, it was running perfectly well then! Very fast and smooth. How things can change! @Graham did you see 178 on the 1712 from Derriford 50 yesterday (that comes off the 124?) 181 is now more of a regular on the 127. The average annual temperature for Plymouth is about 17C, so the incentive to fit buses with air conditioning just isn't really there. I suspect most average journeys are under 20 minutes. Air conditioning would add about 200KG - 500KG to the weight of a vehicle. It becomes something else to maintain and something else the engine has to slog harder to power. In cities like London where the average annual temperature is more like 22C and vehicle weight / power is less of an issue on flat streets, then of course air-con is more of a viable / desirable option to fit. More passengers for it to benefit too. I'm not sure what vehicles (if any) are fitted with air-con in Plymouth. That new Optare demonstrator I've seen around Marsh Mills a few times looks to have an air-con unit mounted on the roof immediately behind the destination board (there's a big white box there which looks like an air-con unit). 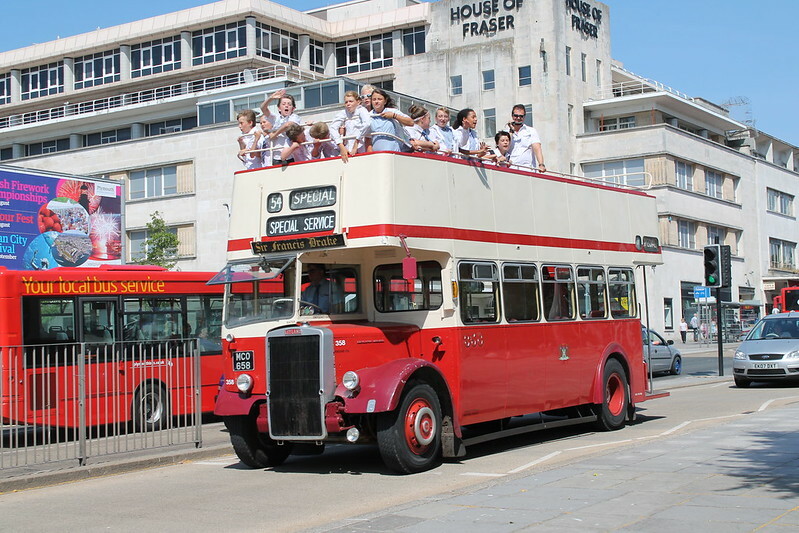 The previous park and ride environs used to have air-con too, on the rear of the top deck. But I think Plymouth has traditionally purchased or acquired cheaper buses without any optional extras like air-con? It certainly does spark an interesting debate. I travelled on an HST to Exeter on Thursday for a meeting. Those refurbished HST's are lovely and cool, and the singular 153 unit we had back from Exeter wasn't too bad either with all the hopper windows open and a steady speed of 60. Even got offered a free bottle of water. The forecast this morning is that the hot weather will last through until Thursday or Friday next week. Then it's going to break-down to thunderstorms. So this time next week we'll probably be talking about the disruption caused by flash floods! Aircon might be too much to ask but it wouldn't be hugely expensive to fit some decent fans or just some windows that get air moving through the bus. The current windows on most of the buses are pathetic. I think it's safe to say the PCB Enviro 400's won't have air-con fitted then!